* Customer Service can be reached through phone at 1-866-236-1695, email at info@myitalianfavors.com and Live Chat. * Customer Service is available to receive orders, answer questions and process returns. Can I order and Pay online? Yes, our website is user's friendly and once you complete your order you you will be able to make payment with your credit or debit cards. Absolutely! One of our Customer Service Representatives would be happy to assist you and take your order over the phone at 1-866-236-1695. We are available from Mon - Fri, 9am -6pm EST. Is ordering though your website Secure?You can shop with confidence knowing that your personal information is protected by our secure server which incorporates a SSL (Secure Server Layer). This is a reliable and a very secure way to make purchases over the Internet. All of your personal information is encrypted when transmitted and will be stored in a secure environment out of reach of any third parties. Please note that any information you send to us can only be encrypted via access to our secure server. At My Italian Favors we take the extra step to avoid any inconviniences for our Customers privacy. We accept all major credit cards, VISA, Mastercard, American Express and Discover. We also accepr Debit Cards. You can also pay by Money orders, Personal Checks, Cashier Checks. In the event that you choose to pay with Money orders, Personal Checks, Cashier Checks, your order will be on stand by until payment is received and clears with our Bank. Some of our items do not have a minimum order quantity such as Confetti Flowers, some of the favors do. Minimum quantity varies per product and is listed for each favor in the product description. If you need any quantity below our minimum order, please let us know and we will try to accomodate your request. Please contact us at 1-866-236-1695 if you have any questions. Yes, after you place your order you will receive an email confirmation followed by another email after the order is processed. When the order is shipped you will also receive an email with the tracking #. My Italian Favors Inc. will process each order within 1-3 business days, and your order usually ships within 2-5 business days if the items are currently in stock. For the personalized favors or Favors on backorder we will require more time for the delivery. You will be notified about the lead time as soon we will confirm your order .Once your order has been shipped, standard ground shipping takes between 3-7 business days to arrive at your door. Samples can be ordered for most of the favors we sell. Cost of the favor plus shipping charges apply and can be ordered online or by phone. SAMPLES ARE NOT REFUNDABLE. Yes, you may cancel your order as long your order has not been processed and shipped. A 5% cancellation fee will apply to all canceled orders to cover any incurred credit card or payment processing fees. The fee will be deducted from the total credit applied to the account. Yes, we honor Rush orders at FREE of Charge. All Rush orders usually ship within 1-3 businnes days. Please NOTE that the Rush order fee is not applied to the shipping. Please contact us at 1-866-236-1695 in order to get an upgrade shipping cost from Ground to Next Day, 2nd Day or 3rd Day. Can I get discounts for large orders? Yes, we will issue discounts for large quantities (see promotions page). Do I get charged Sales Taxes for my order? We only charged sales tax for all orders shipped within the State of Florida . The current rate is 7%. All orders shipped out of the State of Florida are except of Sales's Tax. Can I add/make changes to my existing order after it has been placed? We will do our best to assist our customers who wish to add/makes changes to their order after is has been placed as long your order has not be shipped. Please contact us immediately at 1-866-236-1695 after placing your order so we may better assist you in getting you the items that you wish to order. Please note that we are not able to add/make changes to items from an order that have already been shipped. I need to order more favors, do I qualify for the same pricing as my original order? We do our best to provide you with the best possible price for favors. If we can we will do it but we cannot garantee that this will be possible. If you have placed a previous order with us and need to order more, you are responsible for the reflected costs on our website. Can I have my favors customized? With My Italian Favors you can!! We would love to customize your favors to suit your occasion. Call or email us so we can discuss your ideas. We will create the best favor to accent your event. Does the product come assembled? Many of our products come with packaging options included. Please read the product description provided on the product page for details. Favors such as Confetti Flowers comes full assembled same as photo seen on website. When purchasing Confetti Flowers with Favor Tags we will attach the favor tag to the Confetti Flowers FREE of charge. Will my favor fillings (Confetti) go past their "use by date" before my event? No they will not. When your order is placed, you are asked for your event date. With this information we always make sure that the 'use by date' is well past your event date. All our confectionery is of the highest quality, full health and safety guide lines are adhered to when handling all our confectionery. At this time we do not offer a printed catalog. Does My Italian Favors have a storefront? We do not have a retail storefront and cannot make sales in person. Orders can only be made online and shipped from our warehouses. What currency is represented in your pricing? Prices that are reflected on our website are in US Dollars. Are all products Made in Italy? The product's that are MADE IN ITALY will be stated in the description of the item. There also items that have an Italian design but are not Made in Italy. Do you offer special promotions? We do offer specials and they can only be found on our website. You can see all current promotions on our promotions page. You can also sign up for our newsletter for exclusive deals or ask our customer service team about our Price Match guarantee. Can I order an item that it is on back order? Yes, you may still order the item, however it will not be shipped until the product is received in our warehouse. If you have questions please call customer service at 1-866-236-1695 prior placing the order for an accurate date of availability. My Italian Favors welcomes international orders. We ship everywhere UPS and USPS delivers. If you are an international customer and wish to contact our customer service department, please call our local number +1-561-417-6249 or send us an email at info@myitalianfavors.com. Our customer care representatives are available to assist you Monday - Friday (9:00 am - 6:00 pm EST). What your policy regarding duties, taxes and brokerage fee? For orders shipped to destinations outside of the United States, My Italian Favors is not responsible for any duties, taxes and brokerage fees associated with the shipment. Furthermore, My Italian Favors is not knowledgeable about country-specific import regulations and will not be responsible for fees/damages associated with noncompliance. We strongly encourage you to research all country-specific facts, information and regulations prior to placing an order. We want our customers to be satisfied with our products. At times customers are not happy with the items they received we give them the option to return them. Please contact Customer Service at 1-866-263-1695 within 7 days after receiving the order for a Return Merchandise Authorization before sending any items back to us. Please note that WE WILL NOT accept any return without a Return Merchandise Authorization. No returns are accepted after 7 days. The products MUST to be in original condition and packaging. We reserve the right to reject any returns that do not meet these conditions. There is a 20% RESTOCKING FEE for all items returned. The customer is responsabile for all shipping charges for receiveing and sending items back. We do not accept partial returns (you must return the full quantity ordered). All refund will be issued only upon arrival of return items. We DO NOT accept any returns for Confetti Flowers, Tulle with Confetti, Favor Tags or any other personalized item that was created for the customer. We DO NOT accept returns also for samples and Clearance items. What do I do if I received something damaged? Please contact Customer Service at 1-866-236-1695, indicate the items that are damaged and send photos of the damaged goods to info@myitalianfavors.com. After we received the photos we will replace the damaged items. Please note that My Italian Favors will not be held responsabile if the item is not in stock. In the case that the damaged item is out of stock we will issue you a refund only for the damaged items. All replacements are sent by UPS/FEDEX Ground service. My Italian Favors will not be responsible if the item will be not delivered for the client's event . ALL CLAIMS MUST BE MADE WITHIN 7 DAYS OF RECEIVING YOUR ORDER.Only one claim may be made per order. We deals in many types of materials. Variations in ceramics, porcelains, glass that occur naturally in production of these materials are not considered damages. Since most items in our line are handmade, My Italian Favors cannot be responsible for variations in color, minor variations in design, size, shape, weight or to any accessories added to the product in assembly (stones, crystals, pearls etc). Our customers can be assured that we make every effort possible to control the quality of our products. Packaging coloring may also vary and exact coloring cannot be guaranteed since items may been ordered and different times. My Italian Favors will not be held responsible for any claim made regarding variations of coloring of the item or its packaging, or any fees that may arise to remedy any such claims. Shipping charges are based on the total cost of the products ordered.PLEASE NOTE that Due to weight and dimensions of some items the cost of shipping can be more than the shipping cost you'll see below. You can proceed with your order, however if there is an extra charge due to shipping we will notify you. The shipping cost DO NOT INCLUDE any duties, taxes and brokerage fees. Extra FEE may apply to weighty and large orders. We use UPS, FEDEX and USPS to deliver all orders within the USA. For intermational orders to Canada and worldwide UPS and USPS. The service that we offer when you place an order is GROUND. Can I Upgrade the shipping? Yes, you can upgrade your shipping. Please call Customer Service at 1-866-236-1695 for an accurate shipping quote. Can I get a shipping quote? Yes, you can view our shipping chart or you can call us at 1-866-236-1695 or send us an email at info@myitalianfavors.com and we will be happy to assist you on getting an accurate shipping quote for your order. What it is the transit time with Ground service? 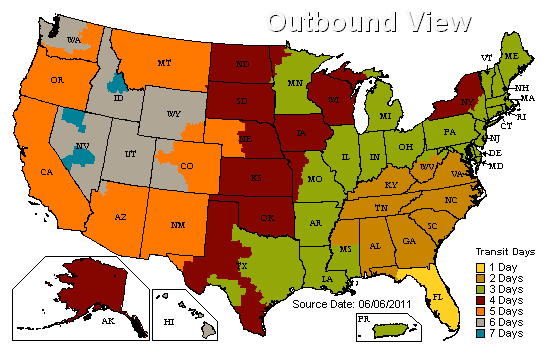 This map is a general representation of UPS Ground transit times when orders are shipped from Florida. Yes, We Price Match. We want you to shop with confidence at Myitalianfavors.com. If you find the exact same item offered at a lower price elsewhere, please give us a call and we will be happy to match the price. My Italian Favors guarantees that you will receive the lowest total price (including shipping costs) on all orders. We do not price match sale or clearance items. How does My Italian Favors protect my information? This site uses a secure socket layer (SSL) certified by Go Daddy to encrypt all of your personal information. We use strong security measures to prevent the loss, misuse and alteration of your information once it is in our records. How does My Italian Favors use my personal information? All information we collect through our website is used solely to process transactions for commercial purposes. Contact information (email address, telephone number, address, etc.) from the order form is used to send your orders and information about our company to you. Your contact information is also used to get in touch with you, when necessary, regarding your order. Financial information (credit card numbers, credit card expiration dates, billing address, etc.) will be used only for billing purposes and are not stored. Do you offer Wholesale Program? Yes, we do offer Wholesale Program only for certain items that we import directly from Italy like Confetti Flowers by the roll, Favor Tags Bigliettini and Italian Silver Argento from the RL and CV Collection. If you are interested to our wholesale program please contact our Customer Service at 1-866-236-1695 for more information. Thank you for visiting My Italian Favors Inc.!!!!! Prices are subject to change. My Italian Favors Inc. reserves all rights for any errors in pricing or in descriptions on website.